A world-first drug trial for Ebola has begun in the Democratic Republic of the Congo amid a killer outbreak. More than 160 people there have already been treated with the drugs, and the way people are treated won’t change, but scientists will now be able to compare them. The announcement came after a devastating week, when 13 cases were confirmed on Wednesday – a one-day record – and officials confirmed even newborn babies are catching the virus. The World Health Organization yesterday announced scientists would begin a multi-drug trial as the epidemic rages on. Four experimental drugs are being used to try and combat the disease – mAb 114, ZMapp, Remdesivir and Regeneron. Patients will get one of the four, but researchers won’t know which they were given until after the study. 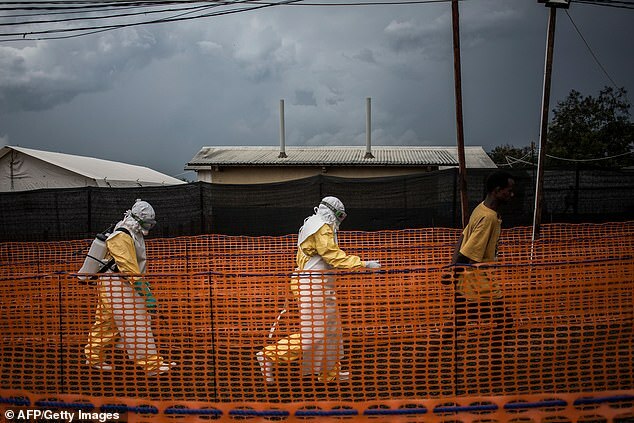 ‘While our focus remains on bringing this outbreak to an end, the launch of the randomised control trial is an important step toward finally finding an Ebola treatment that will save lives,’ said WHO director-general Dr Tedros Adhanom Ghebreyesus. 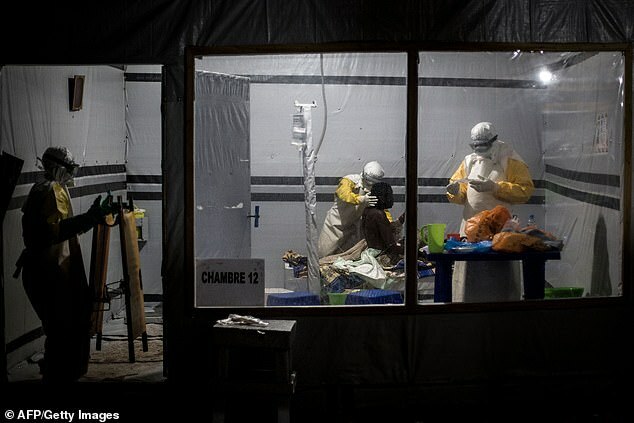 The Ebola outbreak in DRC began in August and, since, is believed to have infected 412 people and killed 236. Some 365 of those cases and 189 of the deaths are confirmed. Because the data collected in the North Kivu epidemic is unlikely to be sufficient for a complete study, the country’s health ministry said the clinical trial may extend over a five-year period to cover Ebola outbreaks in other countries. ‘Our country is struck with Ebola outbreaks too often, which also means we have unique expertise in combatting it,’ said DRC’s minister of health Dr Oly Ilunga Kalenga. The organisation’s director general said he heard ‘heavy gunfire’ over the phone, and a shell hit the workers’ hotel but didn’t explode. Violence is common in the central African country and has made it difficult to stop the Ebola outbreak – earlier in the same week eight United Nations peacekeepers and 12 local soldiers died in an ambush. Armed groups have kidnapped and killed people trying to treat the sick, and ongoing conflict has made locals suspicious of official health workers. Another factor making it harder to combat the outbreak is the widespread use of pop-up unofficial medical centres. People are seeking help in makeshift clinics, some of which are just rooms in people’s houses which don’t have running water and reuse needles. ‘Those facilities, we believe, are one of the major drivers of transmission,’ said Peter Salama, the WHO’s emergency response chief. Experts realised the way the disease was spreading had changed in October, when unprecedented numbers of children started becoming infected. Health workers found these were children being treated for malaria in the unofficial health centres – they believe people are confusing the two diseases because early symptoms, including fever, weakness and vomiting, are the same. HAS THE DRC HAD AN EBOLA OUTBREAK BEFORE? DRC escaped the brutal Ebola pandemic that began in 2014, which was finally declared over in January 2016 – but it was struck by a smaller outbreak last year. 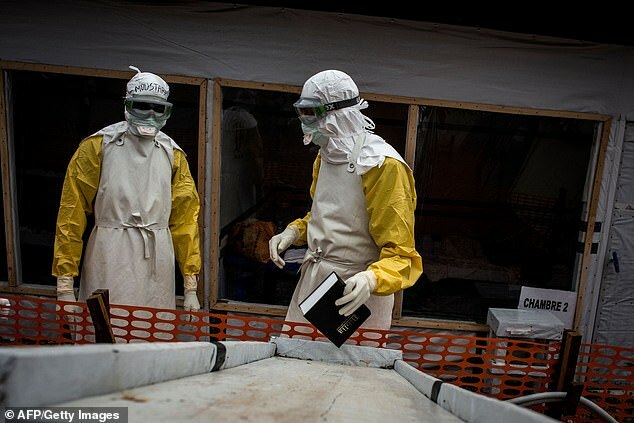 The new outbreak is the DRC’s tenth since the discovery of Ebola in the country in 1976, named after the river. The outbreak earlier this summer was its ninth. DRC’s vast, remote geography also gives it an advantage, as outbreaks are often localised and relatively easy to isolate. 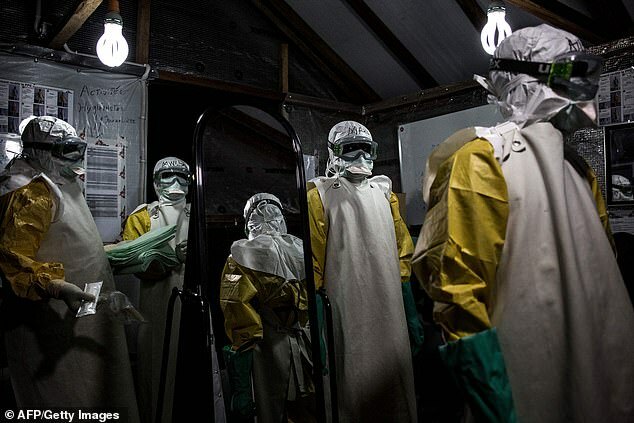 Officials in the country this month said they have never seen such a devastating outbreak. 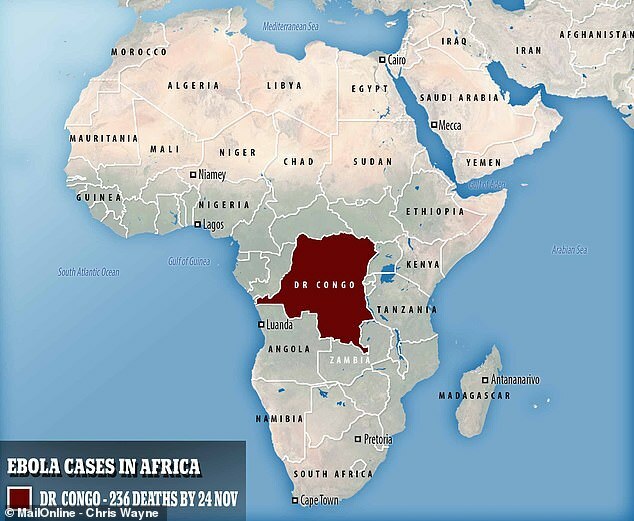 ‘No other epidemic in the world has been as complex as the one we are currently experiencing,’ said Dr Oly Ilunga Kalenga, the DRC’s health minister. Having started on August 1, it is the 10th outbreak in the country since the disease, which causes extreme fever, bleeding and diarrhoea, was first discovered there 42 years ago. ‘This epidemic remains dangerous and unpredictable, and we must not let our guard down,’ said Dr Kalenga. He added: ‘Since their arrival in the region, the response teams have faced threats, physical assaults, repeated destruction of their equipment, and kidnapping. Dr Kalenga said teams responding to the outbreak are violently attacked, on average, three to four times a week. In October, militants killed 11 civilians and a soldier in Beni, a city with a population of around 230,000 people where the outbreak is thought to have started. Despite facing resistance from people who don’t want health workers treating them, the government has managed to vaccinate more than 27,000 people. Unusually, children are being badly affected because they’re catching the virus while in medical clinics for other reasons, experts say. 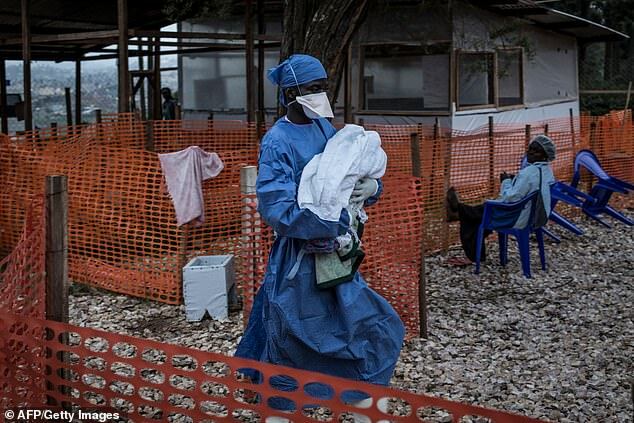 Jessica Illunga, a spokesperson for the health ministry in DRC said in October: ‘There is an abnormally high number of children who have contracted and died of Ebola in Beni. 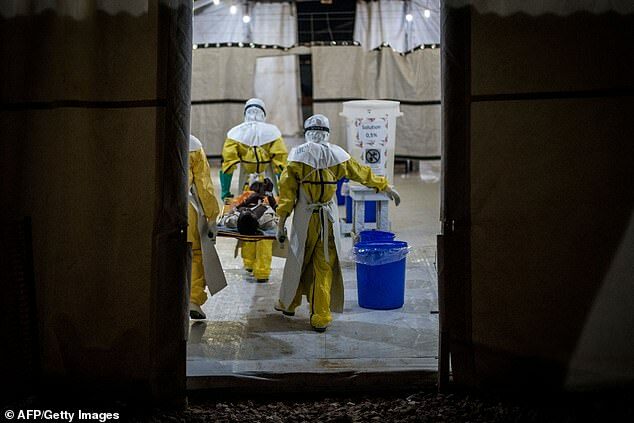 Dr Peter Salama, emergency response chief at the World Health Organization (WHO), last month warned the current Ebola outbreak would only get worse. The combination of rebel violence and pre-election unrest is creating a ‘perfect storm’ for an even worse epidemic, he said.